Fixes an intermittent recording problem that may happen during One Touch Disc Burn. A part of the footages may not be properly copied to DVD if AVCHD footage recorded at HD FX mode and other modes exist in a Handycam® camcorder. * Please note that even after the system software upgrade video footage recorded with a Handycam® camcorder at HD FX mode cannot be copied to DVD as AVCHD footage. 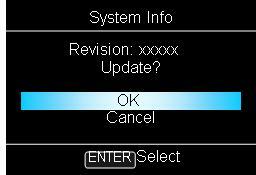 The instruction describes how to update the system software for DVDirect model VRD-MC5. Download the system software update zipped folder VRDMC5Updater.zip and unzip it. Please note where you have downloaded the folder. Within the folder, there is a file, SNDF8U41.DA1, which you will need to create a system software update CD. Create the system software update disc by copying file SNDF8U41.DA1 to a CD disc. Below is how you can copy file SNDF8U41.DA1 to a CD by using Windows XP. However, if you have any other CD burning software, it can be used as well. The important thing is to copy the file SNDF8U41.DA1 onto a CD disc. Insert the System Software Update CD into VRD-MC5. You will see the following screen. To update, select OK. The updating process will take approximately 15 minutes. During this time, it is imperative that the system is not powered off. After the update, VRD-MC5 will turn restart automatically. To confirm the update, power on VRD-MC5 and repeat step 4 to confirm. The new System Updated Version should be 41R1.